Applegarth Estate is so much more than just another security estate, it is a sanctuary that offers privacy and space with its character deeply rooted in the natural heritage of the unique site. The estate is centrally located to excellent schools and academic institutions, such as the International School of Hout Bay, Llandudno and Kronendal Primary Schools, Hout Bay Montessori and also the Kronendal Music Academy. With Table Mountain National Park as a backdrop, the contemporary homes are set within an indigenous landscaped environment and prices range from R5,6 million to R9,5 million, including VAT. No transfer duty is payable. The layout of Applegarth responds to the views, the beautiful treed surroundings and the rehabilitated wetland area – all natural attributes which were central to the overall design. The higher mountain-side homes offer uncompromised views of the mountains north and south, while those arranged around the forest area of the old avenue and the green belt offering a sense of rural serenity. Functional yet exquisite finishes complete the homes while the stunning house designs place emphasis on space, natural light and a connection with the outdoors. Boasting the most current high-tech security systems, including a 24/7 manned gate house, electric security fencing as well as thermal imaging and CCTV cameras, Applegarth is the epitome of safety. 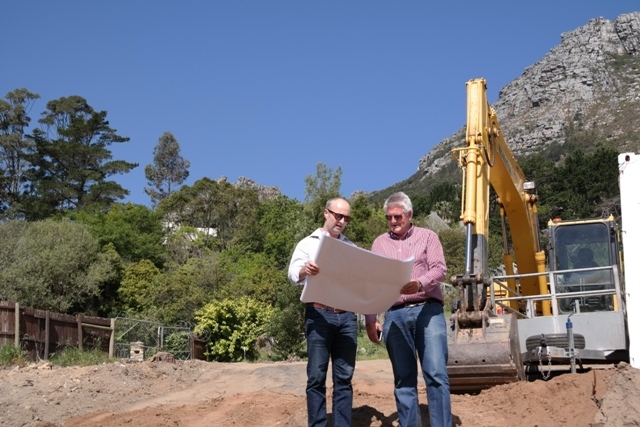 Ground has been broken at Applegarth Estate with the commencing of civil works which are expected to be completed in seven months. Magnus McDowall of developer Flagstone Property Development shared the following sentiments; “With all of the necessary development approvals in place we were delighted to be able to commence with civils so quickly. This not only demonstrates our commitment but importantly is enabled by the very positive reaction from the market. Our existing purchasers and potential investors will really start to get an insight into how the development moves from concept to reality during this time period and we have had a surge of interest in the remaining properties”. To find out more about Applegarth Estate, click here.